Hello “in the playroom” readers, I am happy to guest post in one of my favorite blogs. Thanks Anna for the opportunity! My kids love Minions! 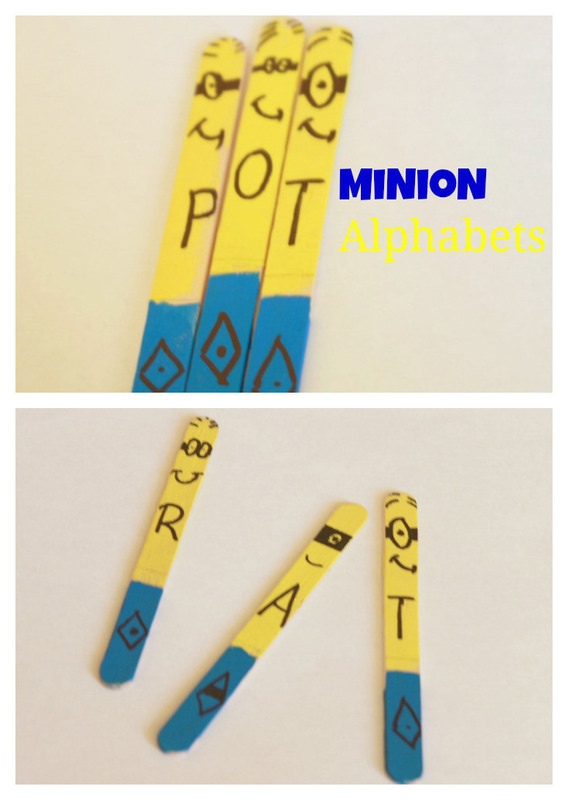 My nine year old and I made Minion alphabets using craft sticks otherwise known as popsicle sticks. My preschooler loves using them and my nine year old is happy to see her sister use them. Let’s see how we made them and how it is used. 1. Attach the large width tape or contact paper on the work space with the sticky side facing up. Stick the popsicle sticks on the tape/contact paper. Make sure that you can remove the sticks without damaging them. 2. 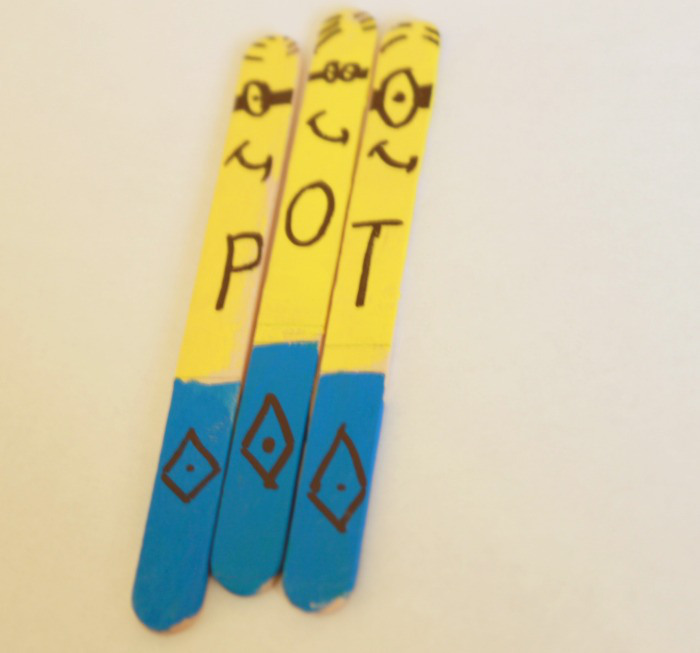 Paint the top portion of the sticks with yellow and the bottom with blue acrylic paints. 4. 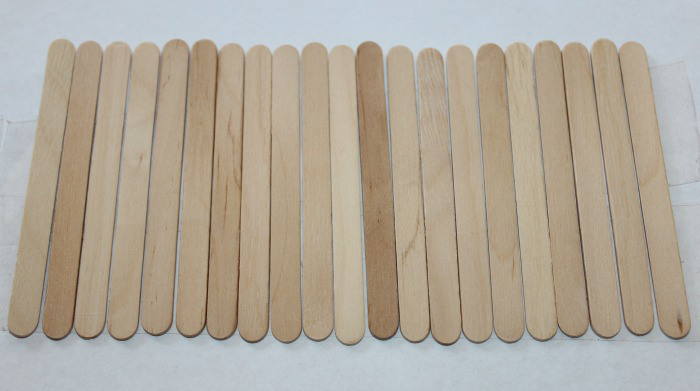 Once dry, remove the sticks from the tape. Draw the features of the minion and write alphabets with the black marker. My nine year old enjoyed making popsicle stick minions. 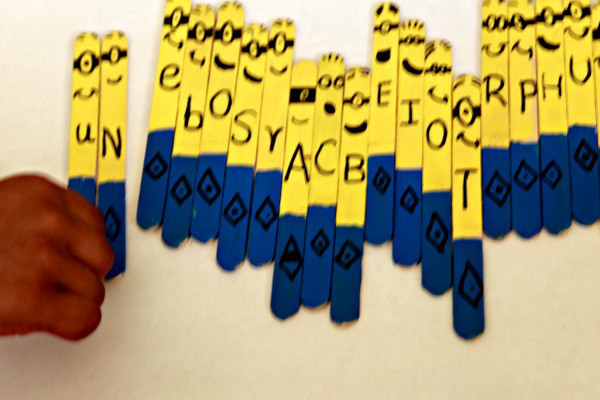 There is no hard and fast rules to play with the alphabets sticks. Write sight words in the sticks. Put the sticks in the center. Take turns to pick a stick. If the child reads the word correctly, the child gets to keep the stick. Whoever has more sticks at the end of the game is the winner! Draw minions with the same emotions. Ask the child to match them and talk about the emotions. Paint the sticks yellow and blue. Draw dots on each colors. Ask the kids to arrange them like a dominoes. As you see, the possibilities are endless with the minion sticks. Hope you enjoyed the post. Please feel free to pin! Once again I would like to thank Anna for this exciting opportunity! Nice meeting you all! My girls are minion mad at the moment, particularly #4 She would love this and I have a stash of lolly stick! Thankyou for the inspiration! Kids Alphabet Games - Huge list of over 20 fun alphabet games!